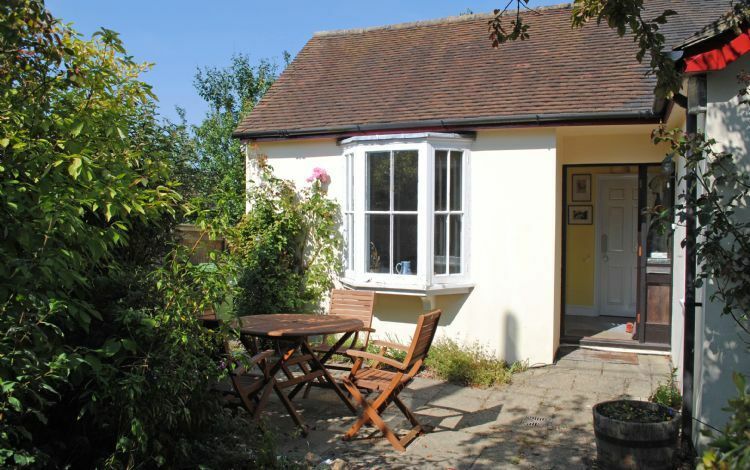 Coombeside Cottage is in the idyllic countryside village of East Meon in Hampshire. Within the South Downs National Park, the village is like a little step back in time, with some wonderful old character buildings around the village centre. It is an ideal location for anyone looking for a peaceful countryside break in a quintessential South Downs village. The cottage itself is set just on the edge of the village, but is just a short walk (less than half a mile) from the village centre and even close to some stunning countryside. It has its own private entrance and small entrance hall, which leads to the sitting room. Here you will find a dining area and a cosy seating area complete with TV. There is a sofa bed, so this can act as a second sleeping area, if required. The kitchenette has a microwave oven with two ring hob, a fridge (with freezer box), kettle and toaster, so is most suitable for small scale self-catering. The kitchen leads to the twin bedroom, with plenty of wardrobe and drawer space, but the main feature of the bedroom is the wonderful view across the owner's garden to the countryside beyond. There is a full bathroom, with a power shower over the bath, wash basin and toilet. Outside, to the front to the cottage, is a private patio area with a table and chairs. In the summer, it is a sun trap in the afternoons and is great for enjoying a spot of al-fresco dining or just a drink in the sunshine. Bei Ankunft war die Unterkunft überbucht. Alternative Unterkunft für zwei Tage war aber sehr gut. Vorab keine Information durch Verwalter oder Vermieter. Freundlicher Vermieter. Kleine Grundausstattung an Lebensmitteln bei Ankunft. Wohnung war nicht sauber. Staub, Hundehaare, Spinnweben. Unangenehmer Geruch. Schöne Umgebung. Ruhig gelegen. Super Restaurant im Ort. Kleiner Lebensmittelladen, wo man das Nötigste kaufen kann. Würde diese Unterkunft nicht weiterempfehlen, da auch die Buchung bzw. Bezahlung sehr kompliziert und undurchsichtig war. Gebucht haben wir über FeWo-direkt. Mussten dann per Mail mit dem Verwalter in England kommunizieren. Erfuhren dann erst, dass auch noch Vermittlungsgebühren hinzukommen und mussten für die Überweisung in Pfund auch noch hohe Bankgebühren zahlen. Somit stieg der Preis der Unterkunft immer mehr. Insgesamt stimmt das Preis-Leistungs-Verhältnis nicht. East Meon dates back to Saxon times and it was a Manor of the Bishop of Winchester both before and after the Norman Conquest in 1066. The Bishop of Winchester built the Parish church and the medieval manor house, The Court Hall, in the 14th century. A stroll around the village will unveil a host of historic buildings and wonderful architecture. There is a choice of pubs in the village, within walking distance of the cottage, as well as a local shop. The larger town of Petersfield lies about 5 miles to the east of East Meon. Petersfield offers a comprehensive range of shopping facilities including the Rams Walk complex, a selection of supermarkets and a twice weekly market held in The Square on Wednesday and Saturday. There is also a good selection of restaurants, cafes and bars. The main line railway station provides a service from Portsmouth to London Waterloo and recreational facilities include The Heath, a lake, an 18 hole golf course and Taro Sports Centre. Where short breaks are permitted the following tariffs apply: 3 nights: 75% of the weekly rent. 4 nights: 80% of the weekly rent. 5 nights: 85% of the weekly rent. 6 nights: 90% of the weekly rent. In order to make a reservation more than 60 days in advance, a reservation fee of 30% of the rental value will be required, the balance then being due 60 days before the holiday starts, along with the booking fee of £35.00 and the refundable security deposit of £150.00. Payment can be made by debit card or credit card, or bank transfer. There is a 3% surcharge for credit card payments. For terms and conditions, please click the link at the bottom of this page.